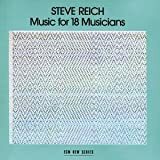 MUSIC FOR TWELVE: Steve Reich’s Double Sextet began the week by copping the 2009 Music Pulitzer, and began this next week by proving to a local audience – in a Colburn School Chamber Music Society program at the Zipper Auditorium — that it deserved the award, every teeming, pulsating note. This is music that sweeps you up; its sound spectrum is grand and irresistible. You hear it the way you hear the “Eroica,” as unfolding melodic material pushing forward from idea to idea. It is a different kind of surging music from Steve’s “You Are” Variations (which is also wonderful) and it holds you in a different way from the hypnosis exerted by Music for Eighteen. I love all this music, and I could not choose among a single one of them. I left Zipper Sunday afternoon totally exhilarated. I didn’t want to wait around for the q&a (Steve wasn’t there); I think I would have been jealous to share this truly profound experience. This was the last of an excellent series of Sunday afternoon chamber concerts at Zipper, nicely organized by Colburn, free to the public and mostly jam-packed. In previous weeks we’ve had visits from the fine old Israeli pianist Menahem Pressler, performing Schubert’s “Trout” Quintet (heaven!) with Colburn faculty, and the Calder Quartet in a sublime program of Mozart K 516 and the First “Rasumovsky.” (Life can’t get much better than that!) Today’s program was an Ojai “sneak preview,” with Lucy Shelton and the blackbird in Schoenberg’s Pierrot Lunaire and a kicky new piece by Stephen Hartke that you’ll have to come to Ojai to hear. The Steve Reich Double Sextet plays at Ojai on June 14, leading off a “marathon” concert that brings the Festival to a close. It has been three years since the misguided management at LACMA dropped any serious involvement with serious music, and it felt strange being back in the Bing Theater last Monday night. Nobody at LACMA seems to promote their few concerts, but the Calder Quartet’s New York management reached out from afar to lure me to an interesting new-music program. The crowd was sparse; you could have played basketball in the empty seats, and a certain Mitch Glickman, listed as “Director of Music Programs,” showed no idea in his intro as to who the Calders were or what the program. Some connection to an Austrian Constructivist exhibition at the museum could be traced in a quartet by the expressionist Beat Furrer, and no excuse need ever be advanced for the Five Movements by Anton Webern (which the Calders performed exquisitely). Music by Ryan Carter and good-ol’-boy Christopher Rouse, filled out the evening, safely and uneventfully. November 26, 1933: at a concert of the Orchestre Symphonique de Paris, Maurice Abravanel leads a suite of Kurt Weill songs, sung by Madeleine Grey. Suddenly there is a demonstration: “Vive Hitler! !” screams a gathering, led by the composer Florent Schmitt. “Why bring in inferior Jewish composers from Germany, when we have enough of our own?” In fairness to the composer of La tragédie de Salomé, the work of Florent Schmitt that the excellent Lionel Bringuier led with the Philharmonic last weekend, his political idol was still painting houses when that tone poem saw the light of day. Just thought you might like to know. The tragedy of this particular Salome, following a poem by Robert d’Humières, befalls only John the Baptist, and not the slithery love-goddess. 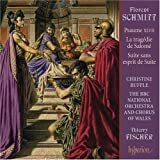 Herod has him decapitated, whereupon Salomé tosses the head into the sea, whereupon it resurfaces and engages in a “Dance of Fear.” The Schmitt ballet score teems with high-class hootchy-kootch, which apparently caught the ear of Igor Stravinsky for a while. Following the lurid travelogues of the Lalo Symphonie Espagnole – and the comparable hootchy-kootch of the violin soloist engaged to further the evening’s entertainment – I found Monsieur Schmitt’s music decidedly tame. The excellent young (23) Bringuier now has the run of the house. His two years as Assistant Conductor (leading to a third as Associate) have been a splendid success, and invitations to further his career have poured in nicely. Credit here befalls Ernest Fleischmann, now incapacitated in a wheelchair but still the vital mind behind the great Los Angeles tradition of discovery and support of conducting talent. In our last conversations, Esa-Pekka took every care to emphasize this important phase in our musical history. So must we all. This entry was written by Alan Rich, posted on April 26, 2009 at 9:51 pm, filed under soiveheard.com. Bookmark the permalink. Follow any comments here with the RSS feed for this post. Both comments and trackbacks are currently closed. The name of the violinist who was “engaged to further the evening’s entertainment” with the LA Phil last week is Joshua Bell and his playing in the Lalo’s five-movement concerto was absolutely brilliant – certainly more than good enough to deserve the inclusion of his name in the review. Your opinion, Mark, not mine; Joshua just doesn’t ring it for me. Yes, Alan, of course it is my opinion. What else can i express in my comment other than my opinion? In this case, however, my highly positive opinion of Joshua’s playing is shared by virtually all of the LA Phil string players that i had a chance to talk to about it during this past weekend. And believe me, most of them were not at all among Mr. Bell’s fans just a few short years ago. But most of us think that his playing has been getting better lately and in the Lalo he was absolutely outstanding. Your opinion is different and there is nothing wrong with that, but frankly i find it odd that a person who can write so eloquently about music, suddenly can’t find words to explain what it is exactly that you don’t like in Joshua’s playing. Whatever that is, not mentioning his name while reviewing his performance seems truly objectionable to me, as if his performance was so bad that he should be ashamed of it. It most definitely was not. And all this is nothing but just my humble opinion.